01. Chant I: Making of Cyborg [M-01] (4:28), 02. Ghosthack [M-02] (5:14), 03. Puppetmaster [EXM] (4:21), 04. Virtual Crime [M-04] (2:41), 05. Chant II: Ghost City [M-05] (3:34), 06. Access [M-06] (3:16), 07. Nightstalker [M-07] (1:44), 08. Floating Museum [M-08] (5:05), 09. Ghostdive [M-09] (5:52), 10. Chant III: Reincarnation [M-10] (5:44), 11. Song See You Everyday! (3:26). 01. Dungeon (1:24), 02. Nishida Kazue Shachu – The Ballade of Puppets: Flowers Grieve and Fall (3:40), 03. Type 2052 “Hadaly” (4:06), 04. Kimiko Itoh – River of Crystals (5:48), 05. Attack the Wakabayashi (3:31), 06. Etorofu (3:55), 07. 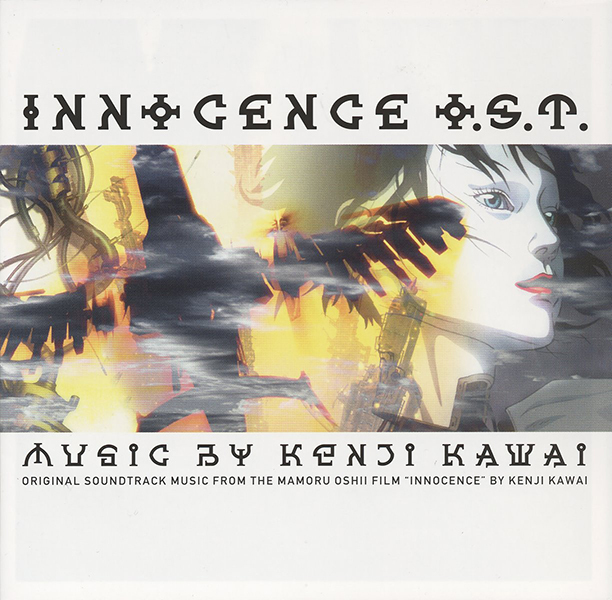 Nishida Kazue Shachu – The Ballade of Puppets: In A New World, Gods Will Descend (5:11), 08. The Doll House I (1:31), 09. The Doll House II (2:56), 10. Nishida Kazue Shachu – he Ballade of Puppets: The Ghost Awaits in the World Beyond (9:47), 11. Yoshiko Itoh – Toh Kami Emi Tame (0:32), 12. Kimiko Itoh – Follow Me (5:01). 01. Utai I -Making of Cyborg- [2.0 Version] (4:28), 02. Ghosthack [2.0 Version] (5:17), 03. Puppetmaster [2.0 Version] (4:20), 04. Virtual Crime [2.0 Version] (2:41), 05. Utai II -Ghost City- [2.0 Version] (3:37), 06. Access [2.0 Version] (3:13), 07. Nightstalker [2.0 Version] (1:45), 08. Floating Museum [2.0 Version] (5:04), 09. Ghostdive [2.0 Version] (5:52), 10. Utai III -Reincarnation- [2.0 Version] (5:44), 11. Fang Ka Wing – Mai Ten Miru Ikken! [2.0 Version] (3:30), 12. Osamu Kara Kidou Tai Yokoku BGM [2.0 Version] (3:02). 01. Chant I -Making of Cyborg- [2.0 Version] (1:45), 02. Atsuko Tanaka – Sound Story Remix 1 (2:15), 03. Virtual Crime [2.0 Version] (2:16), 04. Atsuko Tanaka – Sound Story Remix 2 (1:17), 05. Chant II -Ghost City- [2.0 Version] (2:02), 06. Atsuko Tanaka – Sound Story Remix 3 (4:35), 07. Nightstalker [2.0 Version] (1:32), 08. Atsuko Tanaka – Sound Story Remix 4 (1:48), 09. Chant III -Reincarnation- [2.0 Version] (2:40). 01. Hide – Run Rabbit Junk (4:32), 02. Yakitori (7:09), 03. Stamina Rose (2:51), 04. Surf (3:00), 05. Ilaria Graziano – Where Does This Ocean Go (4:44), 06. Train Search (1:58), 07. Siberian Doll House (3:50), 08. Ilaria Graziano – Velveteen (5:05), 09. Scott Matthew – Lithium Flower (3:25), 10. Stay Home (3:57), 11. Origa – Inner Universe (4:54), 12. Fish -Silent Cruise- (7:30), 13. Some Other Time (4:07), 14. Scott Matthew – Beauty is Within Us (6:08), 15. We’re the Great (1:33), 16. Ilaria Graziano – Monochrome (5:06). 01. Gabriela Robin – Cyber Bird (5:58), 02. Origa – Rise (5:27), 03. Ride on Technology (4:40), 04. Idling (2:48), 05. Ilaria Graziano – I Cant´t be Cool (4:31), 06. 3Tops (3:57), 07. Gonna Rice (2:00), 08. Jillmax – Get 9 (4:41), 09. Go Da Da (1:52), 10. Scott Matthew – Psychedelic Soul (4:45), 11. Emily Curtis – Whatps it For (3:14), 12. Steve Conte and Shanti Snyder – Libving Inside the Shell (6:23), 13. Pet Food (1:28), 14. Security Off (1:13), 15. To Tell the Truth (4:47), 16. Ilaria Graziano – I Do (4:48), 17. We Can´t be Cool (1:32). 01. Scott Matthew – The End of All you’ll Know (2:21), 02. Gabriela Robin – Torukia (6:08), 03. Know Your Enemy (6:24), 04. Laser Seeker (3:14), 05. Break Through (2:36), 06. Flying Low (4:36), 07. Europe (4:31), 08. Hantou no Higashi (4:06), 09. Mikansei Love Story (1:54), 10. Ilaria Graziano – Christmas in the Silent Forest (6:55), 11. Access All Areas (1:35), 12. Sacred Terrorists (4:04), 13. Scott Matthew – Dear John (5:01), 14. 35.7c (1:47), 15. Smile (4:11), 16. Origa – Flashback Memory Stick (1:09), 17. Ilaria Graziano – Dew (5:49). 01. Phase Delight (4:10), 02. Northern Flow (2:37), 03. Transistor (1:13), 04. Static Funk (2:54), 05. Alleyway Sleeper (1:02), 06. Runaway (1:33), 07. Banquet Firewall (5:15), 08. Blur Storm (4:00), 09. Tundra (3:31), 10. Net Cafe (3:52), 11. Black Waltz (1:12), 12. Decisive Action (1:31), 13. Rapid-fire (1:07), 14. Launch Mosaic (0:39), 15. Smooth Combat (4:57), 16. Quartz Movement (2:14), 17. I/O Rain (3:10), 18. Major’s Minuet (3:56). 01. Scott Matthew – Be Human (4:05), 02. Scott Matthew – Trip City (3:55), 03. Patch Me (1:33), 04. Tachikoma No Iede (1:55), 05. Osanpo Tachikoma (2:03), 06. Bang Bang Banquet (2:00), 07. Fax Me (1:26), 08. Rokki-wa Doko (4:25), 09. Spotter (5:56), 10. Let´s Oil (0:45), 11. Hide – Cream (3:54), 12. Spider Bites (0:44), 13. Good by my Master (2:09), 14. Piece by Ten (2:50), 15. Sunny – What Can I Say (1:11), 16. Tachikoma – Hi! (0:05), 17. I´m not Straight (1:23), 18. Sakiko Tamagawa – AI Sentai Tachikoma (1:05), 19. Pro-Bowler Tachikoma (0:38), 20. Don´t Sponge Me (0:36), 21. Po´d Pod (1:02), 22. Ciao! (0:07). 01. CMJK – Crossing Materials @ Jointing Kit (8:19), 02. 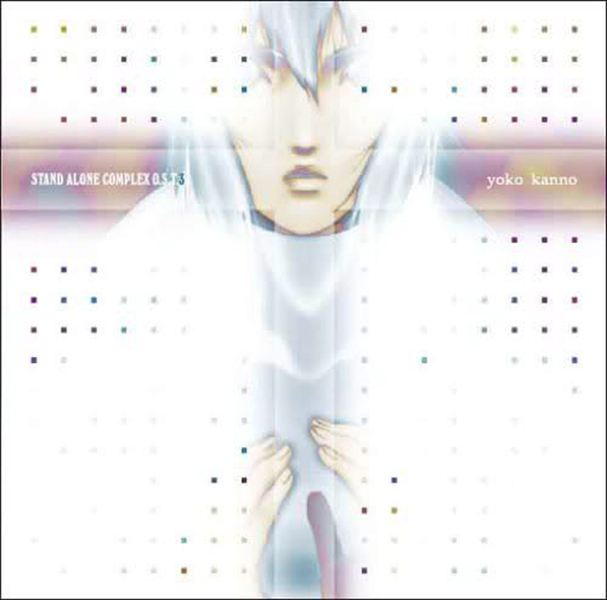 Yoshiki Sugioka – Grind Guitar Complex (4:39), 03. Stacompos2.DnB [Sanodg Mix] (6:25), 04. Yoshimi Katoh – Lu Yu Rice Planting Song (3:24), 05. Title (0:53), 06. Dentsu, Inc. (0:54), 07. Remembrance of Niihama N3 (2:12), 08. Multi-Level Car Parking Tower (2:11), 09. Multi-Level Storage (2:37), 10. Quasi-State Living Block (2:33), 11. Dam Block (2:28), 12. Office Block (2:29), 13. Soldier Drill Field (2:27), 14. Large Ammunition Drill Field (2:27), 15. Jigabachi Dock (2:28), 16. Resource Installation (2:27), 17. Ammunition Factory (2:49), 18. Bio Dome I (2:49), 19. Bio Dome II (3:04), 20. Ending Movie (2:06), 21. Staff Roll [Credits] (4:15), 22. Tachikoma Movie (0:28), 23. Tachikoma Walk [SFX] (0:47), 24. Motoko Specialized Motion Walk [SFX] (1:09), 25. Batou Specialized Motion Walk [SFX] (0:39), 26. Special Actions [SFX] (0:47), 27. Hacking [SFX] (1:37), 28. Guard Robot [SFX] (0:54), 29. Flying Guard Robot [SFX] (0:51), 30. Jeimusun Walk [SFX] (1:03), 31. Electronics Sounds [SFX] (0:57), 32. System Decision [SFX] (1:09). 01. Origa & Heartsdales – Player (5:42), 02. Ilaria Graziano – Replica (5:23), 03. Zero Signal (4:05), 04. Solid State Society (4:40), 05. Tempest (2:52), 06. Born Stubborn (3:25), 07. Gabriela Robin – She Is (2:35), 08. Ilaria Graziano – From the Roof Top -Somewhere in the Silence- (6:34), 09. Undivided (2:03), 10. Blues in the Net (6:41), 11. Human Step -Aramaki’s Theme- (3:32), 12. Origa – Date of Rebirth (4:40), 13. Gabriela Robin – Take a Little Hand (5:05), 14. Remedium (3:10). 01. Opening Title (1:48), 02. Ghost in the Shelll Arise (4:27), 03. Surfin’ on Mind Waves (5:20), 04. Breaking Point (2:13), 05. Instability (1:09), 06. Highway Friendly (2:20), 07. Salyu × Salyu – Jibun Ga Inai (4:20), 08. Confusion Diffusion (2:37), 09. Self Running Landmine (2:12), 10. Logicoma Beat (1:39), 11. Mystic Past in the West (1:38), 12. Encounter an Enemy (1:36), 13. Motoko Action (1:51), 14. ToughDAF (2:11), 15. Solid Iced Air (1:08), 16. Cornelius – Soto Wa Senjou Da Yo (3:52), 17. In the Shell (2:38), 18. Star Cluster Collector (2:33), 19. Ending Title (3:06). 01. A Floating Ghost (1:05), 02. Maaya Sakamoto – Anata wo Tamotsu Mono (3:54), 03. Execution No.9 (4:51), 04. Moments in Love [Piano] (1:51), 05. Body/Head (1:18), 06. An Electric Storm (0:35), 07. Fall All (2:19), 08. Yukihiro Takahashi & Metafive – Split Spirit (4:33), 09. In Search of Many (1:34), 10. Scylla (1:16), 11. Memories Fade (2:50), 12. Involution No.9 (3:06), 13. Vrinda (2:11), 14. Sean Lennon – Heart Grenade (3:57), 15. Deep Breathing (1:38), 16. Highway Friendly Type 2 (3:33), 17. Strange Obsession (1:20), 18. Moments in Love [Harp] (1:34), 19. Maaya Sakamoto – Mada Ugoku (5:46), 20. All Fall (2:52). 01. JLHA – Prayer (6:06), 02. JLHA – Hexahedron Inside (2:23), 03. Pull the Plug – Freak Out (5:14), 04. Vomos – Tachikoma is Flying… (4:55), 05. Kirei – Escapism (4:09), 06. Filter Fish – Selected ID (4:01), 07. Vomos – Sikari (2:03), 08. Kobayashi Hideyuki – Over Flow (4:14), 09. Delua Anti Norm – Lust for Speed (7:24), 10. JLHA – Perfect Out (7:03), 11. G-Brain – Prayer [Remix] (6:20). 01. Mirai e no Yakusoku (5:56), 02. Silent Night (5:49), 03. Mirai e no Yakusoku [Instrumental] (5:57). 01. United Colours (5:31), 02. Slug (4:41), 03. Your Blue Room (5:27), 04. Always Forever Now (6:23), 05. A Different Kind of Blue (2:02), 06. Beach Sequence (3:31), 07. Miss Sarajevo (5:40), 08. Ito Okashi (3:24), 09. One Minute Warning (4:39), 10. Corpse -These Chains Are Way Too Long- (3:34), 11. Elvis Ate America (3:00), 12. Plot 180 (3:40), 13. The Swan (3:24), 14. Let’s Go Native (3:07). *De este disco solo el track nueve es usado en los créditos de la película de Ghost in the Shell 1.0, todos los demás pertenecen a otros filmes. 01. Jillmax – Get 9 (4:44), 02. Origa – Rise (5:30), 03. Gabriela Robin – Icy Mice [Chairman Tadokoro’s Secret Party] (3:52), 04. Jillmax – Get 9 [Naked] (4:42). 01. Follow Me (5:01), 02. River of Crystals (5:43), 03. A Song For You (4:34), 04. My Favorite Things (4:43), 05. River of Crystals [Original Version] (5:48). 01. Cornelius – Ghost in the Shell Arise (4:32), 02. Salyu x Salyu – Jibun ga Inai (4:29). 01. Anata wo Tamotsu Mono (3:57), 02. Mada Ugoku (5:48), 03. Tokyo Samu (5:05). 01. Prologue (1:44), 02. Saeko Hinaga – Mirae he no Yakosoku (5:56), 03. 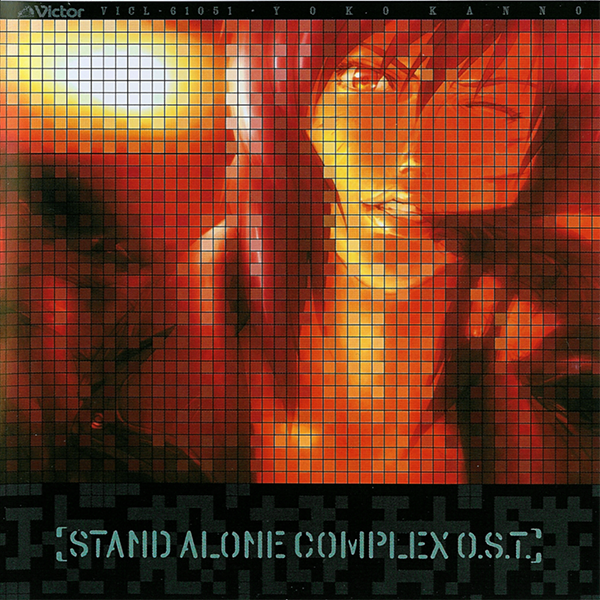 Motoko Kusanagi -In the Battlefield- (4:41), 04. Noh III -Reincarnation- (5:40), 05. 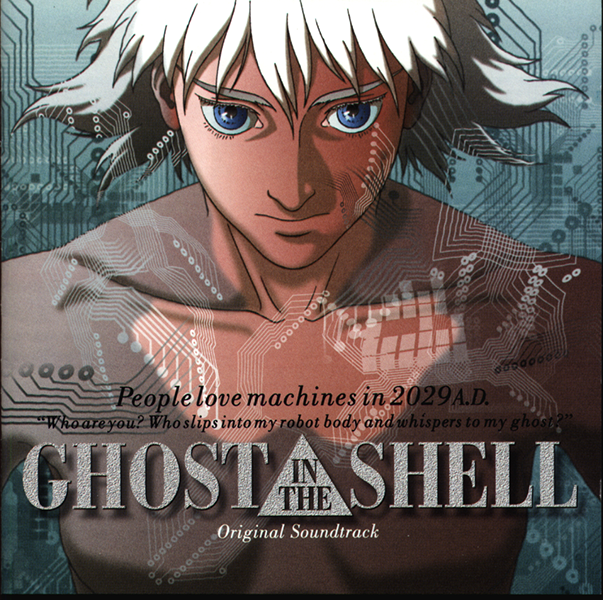 Batou -The Partner of Motoko- (4:20), 06. 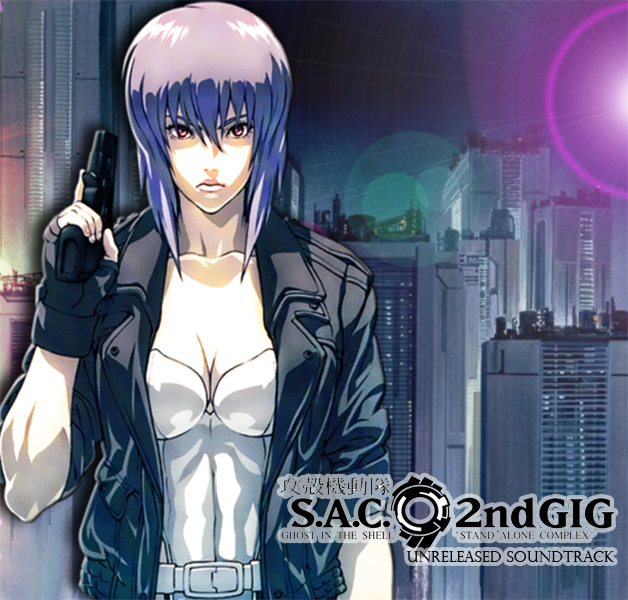 SE1: Handgun by Motoko / SE2: Handgun by Batou (1:05), 07. Togusa & Ishikawa -Unit Member of Section 9- (4:39), 08. Fang Ka Wing – Mai Amami Ikken! (3:25), 09. SE3 -Handgun by Togusa- / SE4 -Chinese Uzi Smg- (1:19), 10. Section 9 of Public Safety -The Secret Service- (4:05), 11. 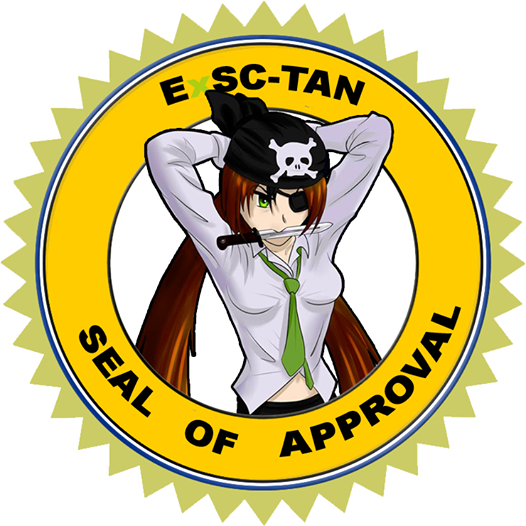 SE5 -Smg by Bodyguard- / SE6 9 -Weapon by Motoko- (0:57), 12. Puppet Master -Infamous Hacker- (4:00), 13. SE7 -Sniped by Section 9- / SE8 -Getemono- (1:09), 14. Motoko Kusanagi -Ghost in the Shell- (3:08), 15. Holi – One Minute Warning (4:57). 01. Takku Ishino – Ghost In The Shell (6:44), 02. Mijk Van Dijk – Firecracker (5:25), 03. Brother From Another Planet – Ishikawa Surfs The System (3:58), 04. Hardfloor – Spook & Spell [Fast Version] (5:53), 05. WestBam – Featherhall (6:42), 06. Joey Beltram – The Vertical (6:28), 07. Scan X – Blinding Waves (4:44), 08. The Advent – The Searcher Part II (3:27), 09. BCJ – Spectre (5:46), 10. Dave Angel – Can U Dig It (7:17), 11. Derrick May – To Be Or Not To Be [Off The Cuff Mix] (7:01). 01. Mijk Van Dijk – Fuchi Koma (5:09), 02. The Advent – Down Loader (6:19), 03. BCJ – Thanato (3:27), 04. WestBam – Moonriver (8:09), 05. Mijk Van Dijk – Brain Dive (4:48), 06. Hardfloor – Spook & Spell [Slow Version] (6:30), 07. WestBam – Die Dunkelsequenz (7:33), 08. Brother From Another Planet – Section 9 Theme (6:01), 09. Dave Angel – So High (5:35), 10. Derrick May – To Be or Not To Be [The Mix Of A Mix Mix] (7:03). 01. System 7 vs Derrick May – Big Sky City (6:09), 02. Scan X – Reflections (7:11), 03. Kabuto – No Brain (6:30), 04. Dave Angel – Latin Lover (4:24), 05. Bryan Zentz – Interfaced (5:30), 06. System 7 vs Derrick May – Prototype 1 (6:44), 07. Joey Beltram – Infinite Wisdam (5:36), 08. Mijk Van Dijk – Toneking (5:51), 09. Adam Beyer – Nanobot (4:53), 10. Dr. Shingo – Defeat (6:15), 11. Shin Nishimara – Disorder (5:49), 12. Umek – Kanzlerlat (3:49), 13. Sam Reeve – Tachikoma Beat Showcase (6:20). 01. Luke Slater – Traktion Action (11:22), 02. Mijk Van Dijk – Soul Survivor (6:59), 03. Kouichi Yamazaki – A Point of No Return (4:29), 04. G-Spac – City of Dools (4:00), 05. Oliver Ho – The Vision (5:39), 06. Brian Zentz – Floating Point (5:05), 07. Carl Cox – Put Your Hands Up (6:51), 08. Q-Hey – Man Machine (5:23), 09. Shin Nishimura – Undisorder (6:16), 10. Green Velvet – Genedefekt (2:40), 11. Ken Morioka – Broken Mask (5:00), 12. Sam Reeve – Water Fall (6:27). Los discos que aparecen a continuacion son discos no oficiales en el caso del Unreleased Soundtrack es una recopilacion de temas no usados en la serie, mientras que el Music for CD-BOX USB son tracks que aparecian en una USB dentro del BOX SET. Asi que solo existen en la calidad en la que se subieron, a menos que encuentre otros de mejor calidad. CD 1> 01. SAC #05/06/07 (1:27), 02. SAC #12 (0:47), 03. SAC #13 (1:43), 04. SAC #14 (1:50), 05. SAC #15 (2:00), 06. SAC #16-A (0:22), 07. SAC #16-B (1:18), 08. SAC #16-C (1:35), 09. SAC #17 (2:18), 10. SAC #18-A (1:47), 11. SAC #18-B (0:51), 12. SAC #18-C (2:01), 13. SAC #20-A (2:34), 14. SAC #20-B (3:02), 15. SAC #22-A (2:54), 16. SAC #22-B (0:47), 17. SAC #22-C (1:14), 18. SAC #22-D (1:25), 19. SAC #23 / 2ndGIG #07 (3:20), 20. SAC #24 (0:44), 21. SAC #25-A (2:39), 22. SAC #26 (1:28). CD 2> 01. 2ndGIG #06 (1:20), 02. 2ndGIG #17/25/IE (2:33), 03. 2ndGIG #05/11/22/IE (1:29), 04. 2ndGIG #17 (1:31), 05. 2ndGIG #03 (1:18), 06. 2ndGIG #22 (1:33), 07. 2ndGIG #04/05/08/20/21/IE (2:50), 08. SAC #11/17 (2:24), 09. 2ndGIG #01 (2:11), 10. SAC #03/04 (1:12), 11. 2ndGIG #20/22/IE (2:21), 12. SAC #08/10/LM (2:37), 13. SAC #11 (0:26), 14. 2ndGIG #13/18 (5:00), 15. SAC #11/13/LM (1:28), 16. SAC #11/18/26/LM / 2ndGIG #06 (3:13), 17. Torukia [Choir Mix] (2:12), 18. 2ndGIG #06/07/08/24/IE (2:55), 19. 2ndGIG #15 (1:20), 20. SSS #01 (1:40), 21. SSS -Take a Little Hand- (1:46), 22. SAC #22/LM (1:28), 23. SAC #18/LM (1:32), 24. SAC #03/06/LM (1:33), 25. SAC #25-B / 2ndGIG #17 (1:45), 26. Smile [Alternative Mix] (3:23), 27. SAC #10/11 (1:22), 28. 2ndGIG #04/10 (1:20), 29. 2ndGIG #05/07/11/19/25 (1:07), 30. SAC #03 (1:24). 01. Tachikomana Hibi (0:15), 02. Tenohirawotaiyouni (1:34), 03. Omake1 (0:46), 04. Omake2 (0:49), 05. Omake3 (0:44), 06. Omake4 (0:41), 07. Omake5 (0:34), 08. Omake6 (0:46), 09. Omake7 (0:46), 10. Omake8A (0:20), 11. Omake8B (0:36), 12. Omake8C (0:28), 13. Omake8D (0:30), 14. Open Tachikoma (0:05), 15. Tachikoma SP1 (1:29), 16. Tachikoma SP2 (1:13), 17. Tachikoma SP3 (0:09), 18. Kuro Tachikoma (2:05). Ooooh hermano, estos es una maravilla, nuevamente muchas gracias por esto XD. gracias. por la música muy gratificante oir los temas de mi series favoritas. Hola! excelente recopilación de música! me he descargado todos los discos (además el blog no está bloqueado en mi oficina ¡hurra! xD)… además acabo de buscar “Silent Hill” en el blog y veo que tienen muchas cosas, son geniales! 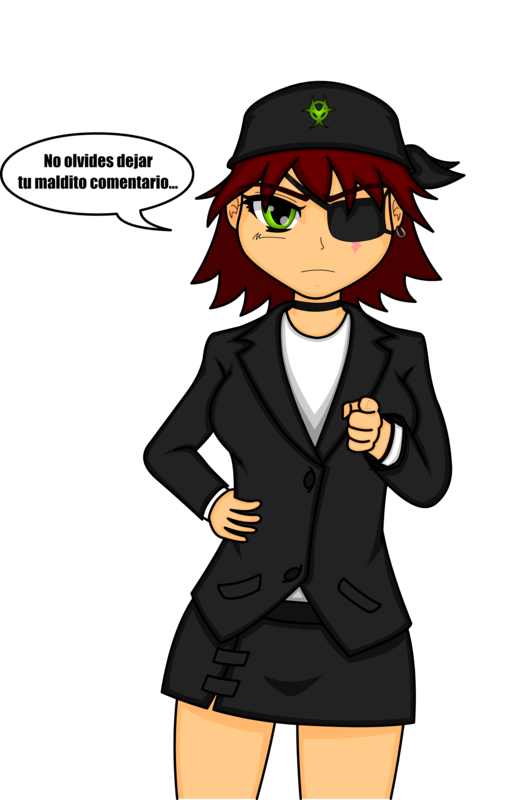 Busca al lado derecho del blog en una imagen de Asuka ahi esta el Password…. que buen post, muchísimas gracias! Mushasho, el link para el album del OST la primera película está roto. Muchas gracias por el aporte a la libre circulación… página a favoritos!!! Excelente aporte me alegro de haber llegado a este blog! Es terrible el trabajo de esta página nunca vi una recopilación tan completa de las BSO de GITS!!!! decirte genio es poco….SUBLIMEEEE!!! hace mucho tiempo buscando el OST….GRACIAS!!! 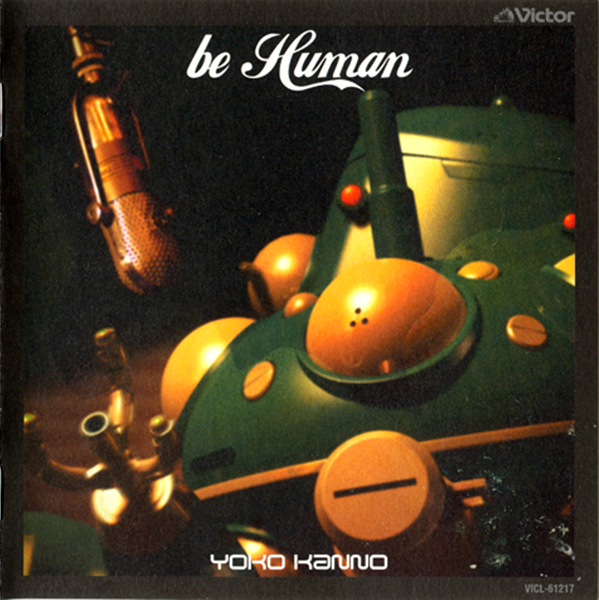 Si dice compuesto por Yoko Kanno, tengo que escucharlo. muchas gracias por la musica. Muchisimas gracias, hace mucho estaba buscando un par de discos que me faltaban. Desafortunadamente algunos links se encuentran caídos 😦 como los de Stand Alone Complex… pero aun así, buen trabajo, saludos! broken links arreglen 😛 gracias x el aporte de todos modos!! hola, excelente compilacion de discos, podrias resubir los archivos por favor. Ya no están disponibles. Es una gran lástima ya que es una recopilación muy completa. Espero que el problema se resuelva, por otra parte. Excelente aporte.